Facebook Video Chat Not Working | Video Calling Not Working | Free Pc to Phone Calls, Free Voip Calls to India International ! Few months back, we posted on Facebook Video Calling and how to enable this service and start making video calls on Facebook. Well the tutorial came out really well and many people started making video calls on Facebook. 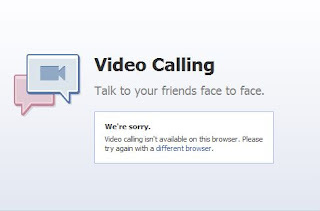 However a lot of people are still deprived of video calling feature of facebook because of certain issue they faced. In this post we will cover the common issues that people have faced. Facebook Video Chat not working ? Facebook Video Calling not working ? 1. Facebook Video Chat requires a one time setup, however just to ensure that it is enabled in your account : follow tutorial in this post. Make sure that you have done the one time setup properly. 2. Video calling works best with the latest versions of the following browsers: Mozilla, Firefox, Google Chrome, Internet Explorer, Safari. Note that video calling for Linux is not currently supported. You will need to use one of these browsers in a Mac or Windows operating system. 3. Check your webcam : Make sure it is working properly and any other program is not using it. 4. Restart your browser : make sure it is up to date. Also some antivirus can cause problems. Try updating it. 5. I am assuming that your hardware is compatible. Facebook video calls use Skype. Q1. I do not want some people to call me : video call. Ans : When you are available for chat, you are also available for video calling. Keep in mind that only confirmed friends can call you on Facebook, and you always have the option to ignore any call you receive. Q2. Can I block specific friends from calling me? Ans : Create a friend list that includes the people you’d like to prevent from chatting with you. Now change the availability option and make yourself invisible for them. Q3. Make Video Calls on Facebook without Webcam. Ans : You can still use video calling even if you don’t have a webcam. You will be able to see and hear your friends, but they will only be able to hear you. Facebook Video Calling Plugin won't Install ? Use this link to reinstall video calling. Go to the Control Panel. Select Programs and Features. Choose “Facebook Video Calling Plugin” from the list of programs and click Uninstall. Then again follow the steps we mentioned in the tutorial about Facebook Video Calling. If you still face any problem then contact us. Either a drop a comment here itself or contact us on Facebook!